There was another graph going round the other day, showing that atheists, agnostics, Jews and Mormons had the best general knowledge of religion. That study pointed out that the single biggest predictor of religious knowledge was the level of education achieved. So I might wonder if the real message of the first graph is that people with a university degree are more likely to be atheist or agnostic, or Jewish or Buddhist.. I think it’s true that in the USA and Europe the education level of atheists/agnostics is generally higher than for Christians. But I also think the figures do represent different selection processes. 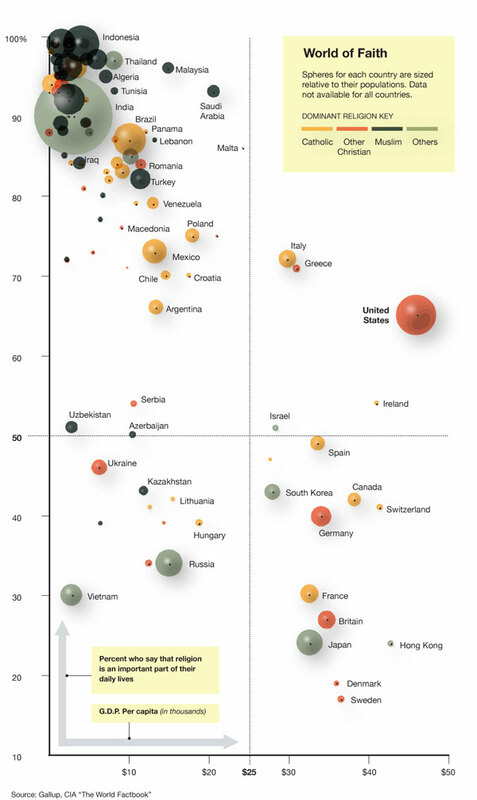 In USA and Europe where Christianity/atheism etc is most common the use of computers is more widespread so the effect of education shows up (there is less selection for education). But in Asia where most Hindus and Buddhists are there would be a selection of the more educated, western, less traditional groups. Both in use of computers and use of dating sites. So I think that pushes the education level, familiarity with English,writing proficiency up for those groups.